Cleveland-Marshall College of Law strives to keep our alumni connected to the law school and each other. In order to do this, Cleveland-Marshall College of Law has authorized Publishing Concepts (PCI) to launch a project to update contact information for all Cleveland-Marshall graduates and create a new alumni directory. You will receive e-mails, postcards, and phone calls from PCI requesting that you update your contact information. We strongly encourage you to respond to these communications. Once PCI has collected alumni information, the company will compile the data and create a new alumni directory. This alumni directory will be available for purchase once the project is completed. We look forward to your participation in our alumni directory project. If you have any questions, please contact Amy Miller, Director of Alumni and Donor Relations, at a.l.miller86null@csuohio.nulledu or 216-687-2537. I received an email/postcard/phone call from a company asking for my personal information. They said they were working on a directory for Cleveland-Marshall College of Law. Is this a legitimate project, or is it a scam? We have partnered with PCI (also known as Publishing Concepts) to produce our new alumni directory. PCI is a company located in Dallas, TX that publishes directories for educational institutions, fraternities, sororities and military organizations across the nation. Any communication from PCI is legitimate and should not be considered a scam. This project allows Cleveland-Marshall College of Law to receive important updates to our database so we know more about our alumni and how we can better serve you and future alumni. a. The names, addresses and information provided to PCI by Cleveland-Marshall College of Law for the publication of the Directory will be held confidential by PCI, except to the extent that they are utilized in, or in the preparation of, the Directory and except as required by court order or law. b. The Directory will be made available only to alumni of Cleveland-Marshall College of Law. Upon completion of the project, PCI will return to Cleveland-Marshall College of Law any and all electronic files that have been supplied by Cleveland-Marshall College of Law or produced by PCI in connection with the production of the Directory. If you have received a postcard or an email with a telephone number, you may call the number to speak with a dedicated representative for the Cleveland-Marshall College of Law project. The representative will verify all the information we have on file for you and make any updates where needed. 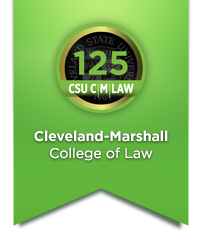 One of the numbers dedicated to Cleveland-Marshall College of Law alumni is 1-866-571-1774. If you have received an email with an embedded link, you may go to the online site to review your information. If you have questions, you may call PCI's customer service desk at 1-800-982-1590. The Cleveland-Marshall College of Law Alumni Directory is available for sale only to Cleveland-Marshall College of Law alumni. The total duration of the directory project is about 12 months. Since we began the project in October 2018, the directories will be distributed in October 2019. When you call to update your information, you can tell the representative what information you would prefer to have excluded. You may also communicate this information to the PCI customer service desk (1-800-982-1590) or to Amy Miller, Director of Alumni and Donor Relations at a.l.miller86null@csuohio.nulledu or 216-687-2537. Call the PCI customer service help desk at 1-800-982-1590, and they will take care of this for you. The true test of a law school's quality is the achievement of its graduates. C|M|LAW is fortunate to have a strong and supportive family of alumni, who have excelled on the local, regional and national levels. The Giving & Support link provides a resource for learning about how you can help to support the College financially. It also contains the list of donors who have shown their generosity during the academic year. You can also find a link to the C|M|LAW Alumni Association. The C|M|LAW Alumni Association is an independent non-profit corporation dependent on proceeds from its special events and programs to underwrite its activities. Its mission is to support, serve and promote the College of Law, its alumni, students, faculty and staff by offering quality educational and professional programs and opportunities designed to enhance the reputation and foster pride and involvement in in the Cleveland-Marshall community. The Association urges all alumni to become members of the Alumni Association - it's free. Join now! or by calling a member of the Advancement Team at 216-687-2300.